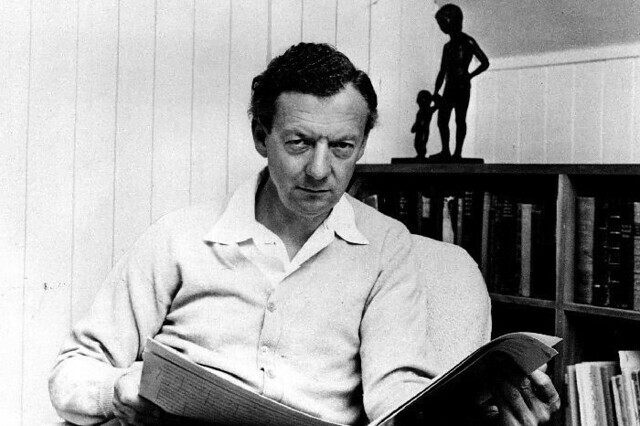 Today marks 100 years since the birth of Benjamin Britten, one of the great composers of the 20th century. Britten’s compositions span classical music forms, from large-scale symphonic scores to songs and choral works. He first achieved international fame in 1945 with the acclaimed premiere of his opera Peter Grimes. One hundred years after his birth, more operas by Britten are performed worldwide than by any other composer born in the 20th century, and he is widely credited with founding a new English-language opera tradition. He also introduced generations of children to music through such works as Noye’s Fludde and The Young Person’s Guide to the Orchestra, which is now the focus of an iPad app. 'His music really gets under your skin, which makes him stand out,' says Royal Opera Music Director Antonio Pappano. The Britten 100 celebrations have seen fans and arts institutions alike come together to commemorate Britten and his music. Today there will be performances of his music across the globe. His work will also feature on BBC Radio 3's Composer of the Week and In Tune, alongside a live broadcast of the BBC Symphony Orchestra Centenary Concert. These follow a number of musical tributes to the anniversary including performances at the Royal Opera House of his opera Gloriana and the Canticles, and the unique Grimes on the Beach at the Aldeburgh Festival. A feature-length drama/documentary entitled Benjamin Britten – Peace and Conflict has been released and Britten is even depicted on the Royal Mint's new 50p coin, the first composer to feature and the only non-royal to have their full name on a coin. Britten's legacy has reached outside the realm of music too. In just a couple of recent examples, film director Wes Anderson describes The Young Person's Guide to the Orchestra as the musical backbone of his film Moonrise Kingdom; and Patrick Stewart describes how - during his performance in Shakespeare's A Midsummer Night’s Dream - he longed to be a countertenor singing in Britten’s operatic version. What makes Benjamin Britten such an important composer? What works of his are your favourite and why? thanks very much , I always love is music and plays. very much appreciated.